Our Hewett-Arney family is here to serve your family in a time of grief and sadness when the passing of a loved one occurs. We are committed to serving you and hold ourselves to the highest standards of the funeral profession. Thank you for visiting our website. Feel free to look around and get to know our family. We invite you to browse the packages (WHICH INCLUDES A STEEL CASKET AND GRAVE DIGGING) we have put together and please feel comfortable enough to stop and submit a question or comment if you wish. We take pride in offering beautiful, personal and dignified burial and cremation services at respectable rates. Make us your family tradition. 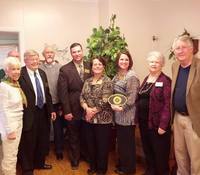 Pictured is our family with some of the Temple Historic Marker Committee members. We are honored to be recognized as a historic landmark in our city. We are now accredited by the BBB of Central Texas. We take pride in holding ourselves to a higher standard and will always provide personal and caring service to the families we serve.